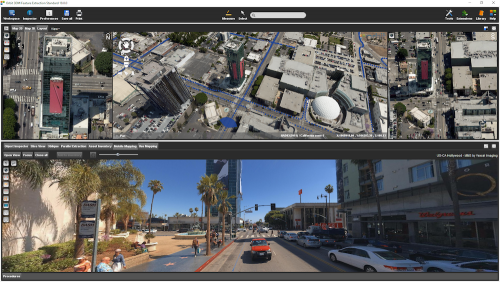 Orbit GT launches the 3D Mapping Feature Extraction Standard product version 18. 3DM Feature Extraction Standard is Orbit GT’s flagship product, including a ton of tools to assist all users with ease of use, minimal learning curve, all-in-one solution, and assisting procedures up database connections and to QC tools. FE Standard is the workhorse for many 3D Mapping companies and government agencies and is leading the market for over 5 years. The image shows a point cloud dense matched from aerial oblique imagery in perspective, indicating photo recording positions from vehicle based mobile mapping and the viewpoint and view angle of the spherical image show in the bottom half of the screen. Left and right of the 3D point cloud view, the north and south viewing oblique images are showing the same building. Data © Vexcel Imaging. As we experience many of Orbit GT customers are using several techniques of reality capture, such as Mobile Mapping, UAS Mapping, Oblique Aerial, Indoor and Terrestrial scanning, we worked hard towards an integration of our portfolio to offer a single product line covering the needs for each of these domains. This native integration is a sure win for every customer and user.